Even in Russia , the weasel tried to expel from the houses, using various folk remedies, such as a spinning wheel with a spindle, with a piece of red wool or tissue, put in front of the chicken coop, seeing that, as a rule, the beast is afraid and don't come back in this yard, either attached to the fence stick with wearing it with hemp tow, which, according to the veteran, could scare off the animal, etc. We also offer convenient, simple, practical and proven method for catching weasels, which will be discussed below. A 2-liter bottle, a bucket, bait. To catch a weasel yourself using traps made easy.Take a two-liter plastic bottle, cut the neck to thicken and cut off the bottom. Please make the throat part is cutting in the form of a spear in order to put there the bait. Put the bait (piece of meat) and put the bottle in the place where I noticed the affection, so that the side with the bait dangled from a chair or a table. Put under the hanging edge of the bottle bucket with a lid. The lid open and set so that in the event of fluctuations in the buckets she managed to close. Wait for the weasel will go for the bait. The animal will make their way into the bottle from the bottom and when you reach the bait, the weight of the body tipped the bottle and the animal along with the trap will fall directly into the bucket, the lid of which slammed shut from the vibrations and weasel will be in prison. Get that animal away from the house and release in the woods. In addition to this method for catching weasels, you can use a trap or traps for catching rats, which will simply need to put the bait in the form of meat or sausage. The weasel is the smallest carnivorous animal belonging to the order of predators in the territory of our country. 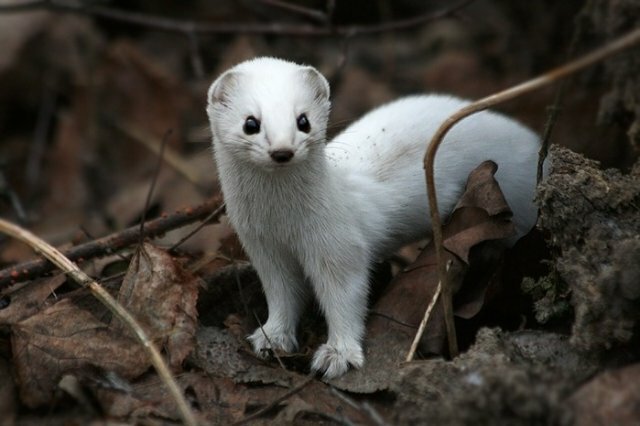 The weasel has great similarities with an ermine to the body structure, its flexibility and color fur, but distinct from it, as it has a smaller size and the color of the tail, he is a weasel plain and without a kind of black tassels, which is available from the ermine. The body of petting a small, thin, long and flexible with short legs, elongated head and small rounded ears. Since the caress is a predatory animal, she eats meat, respectively, and finds food for himself frequently, settling in private houses, and killing domestic animals such as chickens, ducks, etc. In this case, just need to get rid of the intruder and catch him. Weasel – small carnivorous animal. He is considered one of the most dangerous enemies of domestic animals in nature. 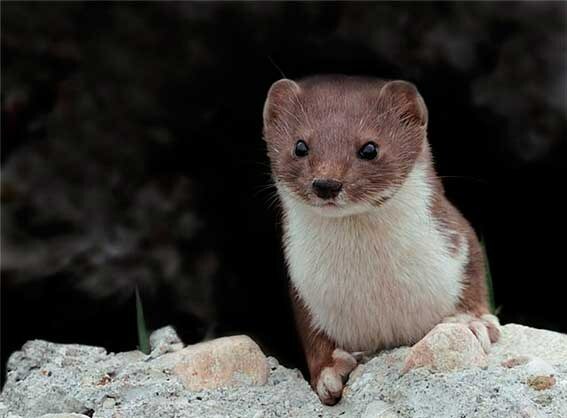 The life expectancy of the weasels in the wild is about 5 years old at home longer – up to 8 years. The length of the weasel is small – from 10 to 24 cm, weight from 50 to 100 g to Meet the animal in North America, North Asia, Europe. Caress is perfectly settled in the fields, lowlands, mountains, and areas of woodland. Usually it settles in the hollows, are not too high from the surface of the earth, in piles of rocks and burrows. Weasel is a pretty frequent visitor of settlements. It was there that the animal has a chance to eat something tasty. The bottom of the neck, chest and abdomen caress is painted in white color. While the top body has a color of brown chocolate. The fur of this predator's thick and short. Long, thin fingers located on the short arms of affection. It is worth noting that this predator very sharp claws. The tail is short. The head is elongated and tapers gradually to the nose. Rounded ears, small nose, and large dark eyes. Neck very muscular and broad. LaSky perfectly developed sense of smell, hearing and sight. In nature each individual has its own territory. It often reaches up to 10 hectares. the Predator is only a single way of life. In search of food during the day can run about 2 km. is Well able to swim and not afraid of water. The weasel is able to climb trees. In short, cunning, smart, aggressive, daring and resourceful. The activity of life is showing both day and night. Preferences in hunting gives most of the night time. Moves mainly by jumping. Affection afraid of small animals, especially birds, moles, rats and mice. She also eats the eggs of birds. By the way, this is the main food of weasels. Often a predator can eat snakes, lizards or frogs. Despite the courage and daring nature, petting a lot of enemies in nature – birds, Sables, wolves and foxes. Increasingly give birth to a weasel as a pet. It is worth remembering that seemingly sweet and delicate creation has a rather tough and defiant nature. To date, the exotic Pets to surprise quite difficult. Sometimes even that as a pet in the apartment were a lion or a crocodile. The weasel – an animal that is currently almost forgotten. Although not long ago this animal was widely distributed in the homes of Europeans. The affection were attributed the same function as now to cats. This animal is caught rats and mice. Eating weasel is not particularly fastidious. With the skill can take a lunch at the neighbor's dog. Weasel perfectly adapts to home content. But easily and quickly obtain a faithful and devoted pet will not succeed. It will have to work very hard because it is very snappy and nervous animal. In building affection is desirable to take a small cub. But in this case can cause problems with feeding. At this age they are extremely demanding. That is why in most cases animals are adopted as adults from wildlife. Note: eggs, clean water and quality fresh meat always needs to be in the diet of weasels.